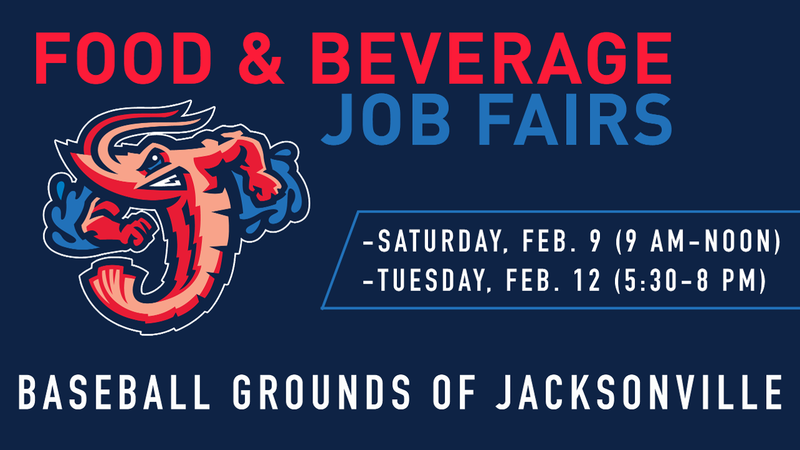 JACKSONVILLE, Fla. - With the Jacksonville Jumbo Shrimp's 2019 season of affordable family fun on the horizon, the club has set two job fairs in February for 2019 seasonal food and beverage positions at the Baseball Grounds of Jacksonville. The Double-A Southern League affiliate of the Miami Marlins will host job fairs from both 9 a.m.-noon on Saturday, February 9 and 5:30-8 p.m. on Tuesday, February 12 at the Baseball Grounds of Jacksonville. Interested applicants may find full position descriptions and an application form at www.jaxshrimp.com. Applicants may bring a completed application to the job fair. All applicants should be prepared to interview at the job fairs and are encouraged to bring a resume and dress appropriately. Potential employees are subject to a background check and drug test. Open positions are for seasonal employment, including but not limited to 70 Jacksonville Jumbo Shrimp home baseball games, additional stadium events and training.